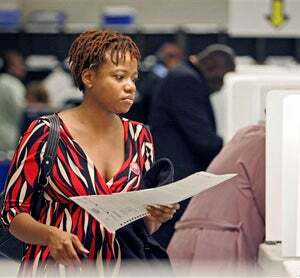 A couple of days ago, we brought some attention to the issue of the GOP attempting to disenfranchise voters in order to swing the election, and used this picture from the Associated Press. Rose Carter, pictured, got in touch with us today to let us know that she's been actively voting since she was able, or she would have been if the GOP didn't keep trying to keep her from the ballot box. She wrote, "I am a long time registered and active voter. I chose to vote early for the 2008 Presidential Election, as I did in the March primaries, because I was a victim of voter disenfranchisement in the 2004 Presidential Election. Due to the underhanded tactics of then Secretary of State Kenneth Blackwell, and the ineptness of the Cuyahoga County Board of Elections, I was forced to vote through a provisional ballot though I was at the correct polling location. After I voted, I contacted the Board of Elections who confirmed that I was at the correct polling location and they offered me a very, very weak apology." So, yeah, this is what they do — and Rose's vote deserves to count as much as mine.